This fall quilt took a lot time to complete. The blocks were done by paper piecing and I was unable to find a pattern for the large maple leaf so my husband designed the large maple leaf block with his graphic software. I didn't think the blues and purples would go well with the quilt, but they give the quilt a very nice look. The overall pattern was all designed by my husband and I was able to see what the finished product would look like before I even finished. 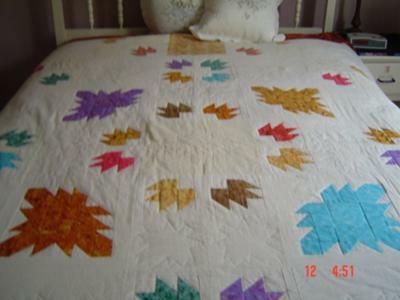 I hand stitched around each maple leaf, and used a maple leaf pattern to hand stitch in the blocks without a maple leaf in them so that the pattern would appear over the whole quilt. The quilt fits a queen sized bed and took about two years to complete.